DPSCD Board Member candidate (left) delivers bottles of water to John R. King Academic and Performing Arts Academy’s principal. Shannon Smith is running for the Detroit Public Schools Community District (DPSCD) Board of Education in November. The first day of school for students in the district was Tuesday and water fountains in every school have been shut off by Superintendent Dr. Nikolai Vitti due to elevated levels of lead and/or copper discovered at 16 of 24 schools tested. 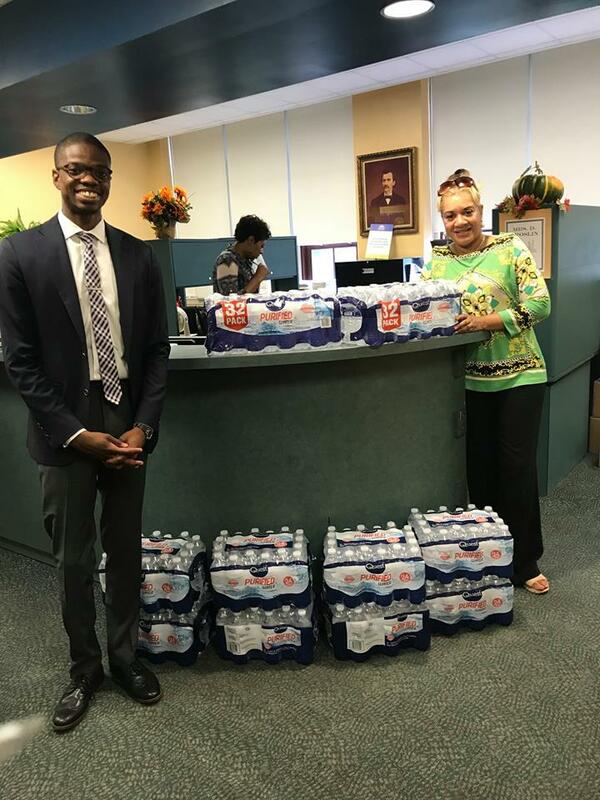 DPSCD is supplying all 106 schools with cooled water coolers, but Smith, who is a graduate of Martin Luther King Jr. Senior High School, and his campaign staff stepped up to the plate to assist the district. Smith and his camp visited John R. King Academic and Performing Arts Academy on Detroit’s west side to drop off 10 cases of bottled water to the school. Dr. Vitti hinted that the drinking water crisis in DPSCD schools could be an ongoing issue and was not going to be an easy fix. Smith said his team plans to deliver water to all affected schools and wants the community to get involved. He encourages others to adopt a school to donate water to or to get in contact with him or his team to contribute that way. Alum of DPSCD high schools such as King, Renaissance, and Cass Tech have started similar movements around the city. Dr. Vitti said the cost of cooled water coolers in all district schools will be $200,000 over two months, while his team develops a potential long-term plan for new central water stations at every school with independent piping systems. In the meantime, students are allowed to wash their hands, shower, and use the toilets in all DPSCD buildings. A list of all DPSCD schools can be found here: DPSCD schools.